I believe that a simple addition to the GUI like the possibility of hiding the menu bar (as is present, at least, in every kde app) would be a great contribution towards making LibreOffice more widescreen-friendly. Thanks. Please file an enhancement bug and provide as much information as possible. Don't forget to mark your bug as an 'enhancement'. The QA team will be happy to help you triage your feature request in the bugtracker. The button needs to be enabled under Tools>Customize>Toolbars. On the left search for "Menubar" and add it to the list to the right. That is for the standard UI. There is also the new feature of "User interfaces" (that can be enabled as "experimental" under Tools>Options>Advanced>Enable experimental features - and then user interfaces can be switched from View>User interface), and (at least in some of the UI there) the option is present either as a button or as an option among the "Menu" options. Developed for MUFFIN and implementation of the Notebook bar. It was not intended to provide this function, but yes it works. 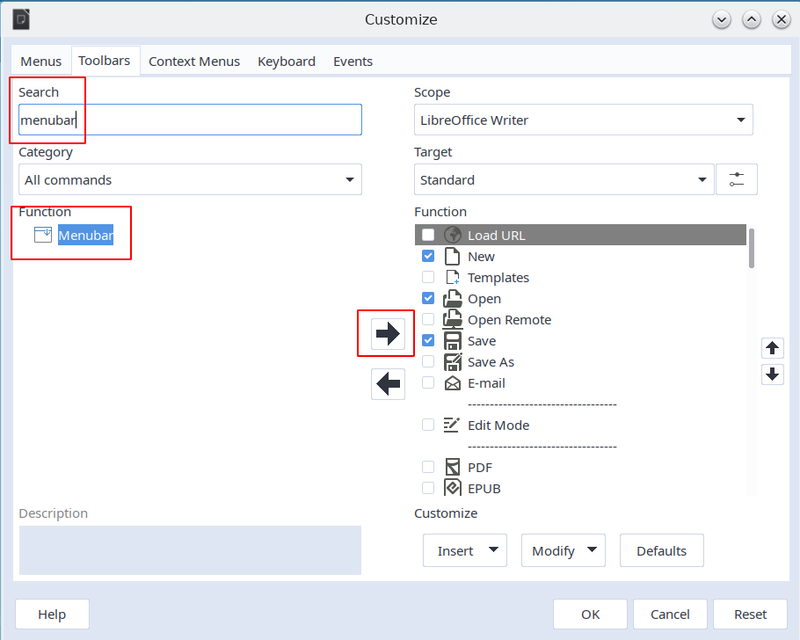 Its button action can be applied via Customize dialog to Menu, Toolbar, and Context tabs for each of the modules--will need to pay attention the target it is added to. Also, you may have to clear user profile to get back to defaults if you get to a point with no access to the menu. I agree, according to me both menu bar AND toolbar could be hidden.